Extreme Excite will assist you in showing Corporate Hospitality to entertain your Staff, Guests, Colleagues, Superiors & Friends. 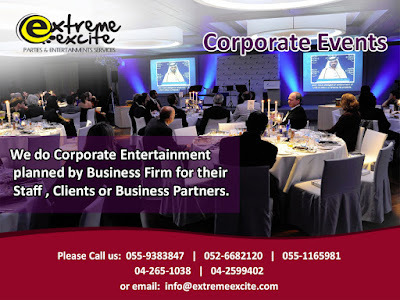 We can offer various Activities, Fun and Entertainment, Venue Décor, Host, Sound System for a dynamic event and full of life, thus, help you achieve your goal. Making a design of specific event An Elegant, Unique & Memorable Event that will last forever.